When James is sent by his conniving aunts to chop down their old fruit tree, he discovers a magic potion that grows a tremendous peach, which then rolls into the ocean and launches a journey of enormous proportions! Along the way, James befriends a collection of singing insects that ride the giant piece of fruit across the ocean, facing hunger, sharks, and plenty of disagreements along the way. 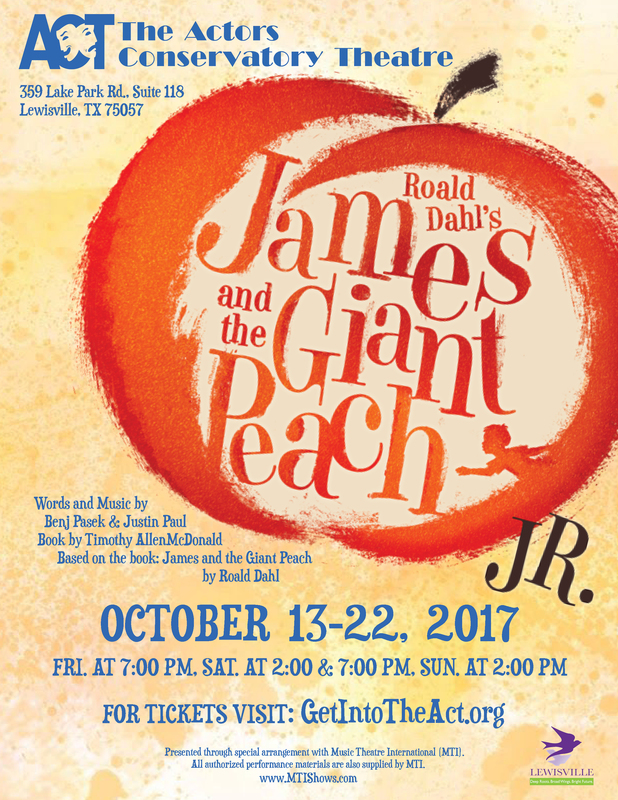 Based on one of Roald Dahl’s most poignantly quirky stories, Roald Dahl's James and the Giant Peach JR. is a brand new take on this "masterpeach" of a tale. Featuring a wickedly tuneful score and a witty and charming book, this adventurous musical about courage and self-discovery is destined to be a classic! Book by Timothy Allen McDonald. Music and Lyrics by Benj Pasek and Justin Paul. Based on the book, James and the Giant Peach, by Roald Dahl. Roald Dahl's James and the Giant Peach JR. is presented through special arrangement with Music Theatre International (MTI).